Father Talks Too Fast: 'If I Could Say It, I Wouldn't Need to Dance It"
'If I Could Say It, I Wouldn't Need to Dance It"
"Love is the perfection of the unnecessary." "Beauty will save the world." "Let them be born in wonder." "Only the lover sings." "If I could have said it, I wouldn't have needed to dance it." When you first think of Christian religion, is your first reaction to think of beauty, wonder, love, and dance? Do we not more often think of mysteries that need explaining and hard teachings that need defending? Has our modern impulse toward the practical and the explainable hurt our experience of the Faith? Have we boxed ourselves in and only allowed ourselves to do that which we can give rational explanation of? Have we limited ourselves to prose, and then been annoyed that there isn't enough poetry in the world? And collectively, the priests and deacons around the country say "Ugh!" 1 ) we just preached on it 5 months ago, in Lent. 2 ) it's hard to preach on. In the seminary they warned us: the more theological the feast, the harder to preach. But even, Christmas and Easter sometimes. ...because we like to explain. We saw that trap back in June on Trinity Sunday: our temptation to explain. The Trinity at least is a big, mysterious doctrine. Today, August 6, the Transfiguration, the whole scene is hard to understand. Weird things happen to Jesus. Weird things said by Peter. Weird final thoughts from the Voice and from Jesus himself. After one of her performances, somebody asked what the dance meant. "If I could have said it, I wouldn't have needed to dance it." "No, sir. I can't explain what it was about, Mr. Spectator Sir." We have this drive to want to make things practical and this drive to explain them. I don't know if that a modern thing. I don't know if it's an American thing. But it's definitely a thing we do. Things have to be immanently practical and we have to be able to explain it all. I don't think that's actually our natural state, but it's where we've gotten to. Think of all the careful steps of two servicemen at a funeral, stiffly, sharply, folding the American flag off of the casket. "Why do they do that?" a kid might ask quietly. "I don't know, kid. But I like it." There probably some symbolism worked out. And that might help a bit. Honestly, the drive to be practical and to explain things has probably been harmful to Christianity. We've trained ourselves that everything needs to be able to fit in nice little boxes in our heads. And that all the things should be explainable to 2nd graders. Or at least to an adult. If we can't exhaust the meaning of folding a flag, can we really hope to cover the depth of our religion? Our natural love for beauty. And our natural love for stories. These are not practical, and often then don't really explain things. Next week I'll talk about stories. Today I'm just talking about beauty. Beauty is done in a lot of ways in Christianity. Beautiful voices singing beautiful music. Beautiful lessons: Prodigal son and the thankful leper and Peter asking Jesus to call him to walk on the water. the hand lifted in absolution. They're not logical and rational and easy. No more than our scene of Transfiguration is. Cuz they're not instruction manuals. 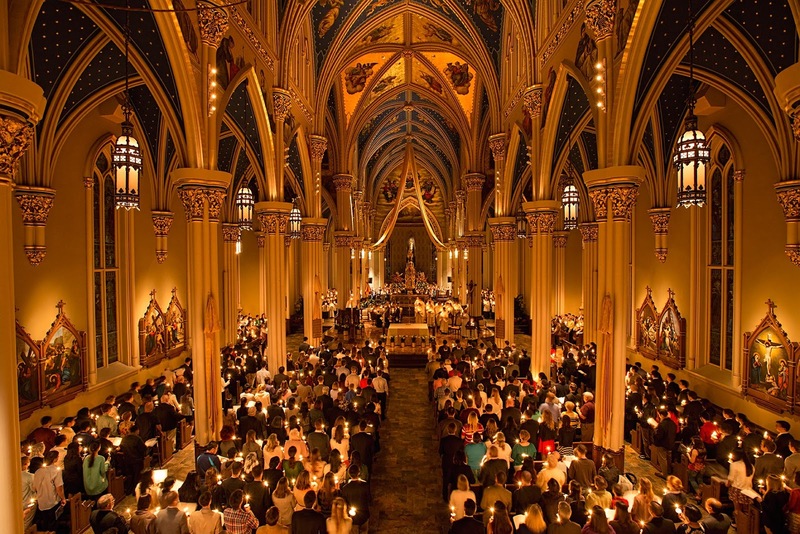 Why do you process around the church and down the stairs with the Eucharist on Holy Thursday? "If I could say it, I wouldn't need to dance it." Incense is a classic one. "Why do we use that?" Quote a Psalm: metaphor for our prayers rising to heaven like incense. "Ok, but why go around the altar swinging it? Why swing at cross, and gospel book, and the people?" Do as a sign of reverence. It's a sign that they're holy, set apart. Cool image: like carving out the altar in smoke to show it's special. Seminarian : smoke rising, lifting it up above this world. It's between earth and heaven now. Might've made that up. I don't know. 6 year old boy : "You using smoke to make a force field around it to protect it from enemies!" "High five kid! That's as good as anything I've got." Because: "If I could have said it, I wouldn't have needed to dance it." Why do nuns where veils and habits? "If I could say it then I wouldn't need to dance it. The explanations of some things are just beyond us, but they still feel reasonable, natural. How does a four-year-old act? "Uh. It means I like you." How do you lovers act? About beauty in sacred art and music. The natural response when we are filled up. Love is about the perfection of the unnecessary. The unnecessary...that we want to do anyways. We have candles all over our churches. They're covered in "unnecessary" ornamentation. We ring bells at the elevation, we put ashes on our heads, we beat our breasts, we lay a large white pall over a casket. Enter in dead silence. The only day of the year. Servers and ministers are kneeling, but the priests fall flat on their faces. They lay prostrate on the ground, like the apostles in today's gospel. That's our standard act of reverence. It's our sign of reverence...when we're on our way to do other stuff. Is this like a double extra special kind of genuflection? Why not on Easter? Jesus busting out of the tomb triumphant! It's the one day of the whole year Jesus isn't even there in the tabernacle. "I don't know. If I could have said it, I wouldn't have needed to dance it." Why do old churches have such high ceilings? In 8th grade social studies, Miss Reynolds told us that the medieval cathedrals were made tall to make people look up and think of God. Another person told me they're high so that on a hot day the heat would rise and leave cooler air on the floor. I thought: "Wow, that's a lot of work with hand-cut stone for a horribly inefficient air conditioning system!" "If we could have said it, we wouldn't have needed to dance it. Out of stone." On Trinity Sunday I talked about us not needing to feel we need to explain everything. Instead we need to worship. And worship is much more like a dance then like an explanation. The Christian faith is heavy on explanation, but even heavier on dances. Easter vigil: the greatest of dances. Many little dances within one big dance. Start with a bonfire, give everyone candles, go into a dark church, sing a song about candles, then up to seven readings telling the whole story of salvation, then we bless water, baptize people, sprinkle more people...and then have a normal Mass! So much stuff it's almost overwhelming. 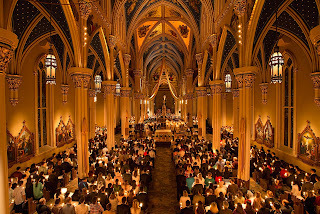 This year on Holy Saturday on Facebook I asked people which they preferred: all the many layers of song and readings and extra rites, or when we try to keep it a little shorter for more people to come and find it more accessible. One person made the argument that they thought the Church over the centuries had intentionally overloaded the Vigil so you could never quite pay attention to all of it. I said, "That sounds stupid." "No, there is something about how you can never quite know if you caught it all. So much stuff of symbol and story washing over you that passes in and out of focus. And you walk out not sure if you understood it, but thinking 'That was amazing.' Intentionally overwhelming." Lines up well with the rest of Catholic Faith. We tell you for years "Pay attention. Pay attention. Look up front, kid. Focus." It's like the Church knows (after centuries of practice) that we're going to get distracted. It's going to happen. So she makes sure we are distracted by cool Catholic stuff. To wrap up, let's come back to the Transfiguration with this new sense of things. "If I could've said it, I wouldn't have needed to dance it."